Red Mountain Flower is harvested from the red-flowered variety of mountain flower. Other varieties of mountain flower yield blue mountain flowers, purple mountain flowers, and yellow mountain flowersDG, but the flowers have different alchemical properties. The blue, purple, and red mountain flowers are commonplace in the foothills and lower elevations of mountains (below the snowline). 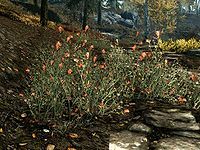 It is one of three ingredients that contain both Restore Magicka and Fortify Magicka effects, but the other two (briar heart and ectoplasm) are much less common than mountain flowers.